Convert, singer, and psychiatrist Evan Thomas will share his journey and his music with us. Baptized Episcopal, Evan’s love of song began at St. Edmund’s Academy in Pittsburgh. He graduated from Bowdoin College in 1978 and Temple Medical School in 1990. He converted to Catholicism at the age of 26. 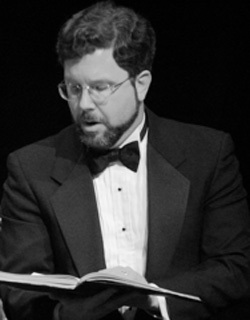 Evan has performed as a soloist and featured professional choral singer in ensembles in Philadelphia, Boston, Pittsburgh and Brunswick, Maine. With Maestro Radu's Vox Ama Deus' ensemble, he has appeared in numerous performances, including a Kimmel Center debut as the voice of St. Peter in Bach's St. Matthew Passion in 2005. He has sung in various liturgical settings, including at the Carmelite Monastery of Philadelphia and for St. Paul's Cathedral Choir in Pittsburgh. In 2009, he sang the role of Capulet in the Delaware Valley Opera Company's production of Romeo and Juliet. When not using his voice to sing praises to God, Evan helps those afflicted with mental illness as a psychiatrist and psychoanalyst for the Horsham Clinic. He and his wife Claire live in Wyndmoor with their 4 children.